The instructions in this section apply to single-server systems. To install the software in a system with more than one server, contact Geocortex Support to arrange a consultation. Please ensure that you have adequate Support hours available. This section explains how to install Essentials on a server that does not already have Essentials installed. If the server already has Essentials installed, follow the instructions in Geocortex Essentials Upgrading. Install Essentials and its components and tools. Configure the method for signing in to Manager. You must run the Post Installer at least once after you install Essentials, even if you do not install viewer templates or make any changes to the configuration—when you click Finish, the Post Installer deploys the Essentials web applications to IIS. Enable the IIS components that Essentials requires. For information, see IIS Configuration. Reserve the ports that Geocortex Core uses and, if necessary, configure firewall access for Geocortex Core. For information, see Geocortex Core Ports and Firewall Access. When you complete this procedure, you will be able to run Essentials on this server. If you want to do additional post-installation configuration, such as activating your Essentials licenses or configuring cross-domain support, follow the instructions in Post-Installation Configuration. This section does not provide instructions for setting up a reverse proxy. To run Essentials behind a reverse proxy, install Essentials, and then follow the instructions in Run Essentials Behind a Reverse Proxy. Before you begin the installation, download the installation packages following the instructions in Download Geocortex Essentials. For information about which components to install on a server, see Geocortex Essentials Deployment. When you complete these steps, you will have a working installation of Essentials. Run the Essentials installer that you downloaded from the Support Center. The Geocortex Essentials Setup Wizard launches. In the Install a new instance of Geocortex Essentials box, type the instance name to use. Read the license agreement. If you agree to the terms of the license agreement, select the I accept the terms in the License Agreement checkbox, and then click Next. The typical installation installs all software components. If you want to change the location in the file system where Essentials is installed, type in the path, or click Change to browse to the location. The custom installation allows you to choose which components to install. If you do not want to install a component, click the icon beside the component and deselect it . This prevents the component from being installed. The Setup Wizard installs the software. When the installation is complete, the Setup Wizard's final panel displays. Make sure the Launch Post-Installation Configuration checkbox is selected. The Essentials Setup Wizard closes. If Geocortex Core is not already installed on the server, the Geocortex Core Setup Wizard launches. Follow the instructions below to install Geocortex Core. If Geocortex Core is already installed but Essentials needs a newer version, Geocortex Core will be upgraded. Wait until the upgrade completes, skip the remainder of this step, and then continue at Step 3: Install the Viewer Template (recommended). This accepts the default installation location. If you want to change the location in the file system where the data files and log files are stored, type in the path, or click Change to browse to the location. If you are going to use Instant Search, the data folder can get very large. Running out of disk space interferes with indexing. Make sure your server meets the Requirements for Servers Running Instant Search. If this is the first server that you are installing Geocortex Core on, select I want to create a new cluster. Enter the cluster name that you want to use and a Shared Secret. If you already have other Geocortex Core instances running on your network, select I want to join an existing cluster. Choose an existing cluster name from the drop-down menu. Cluster names can include dashes (-) and underscores (_), but they cannot contain spaces or special characters. The cluster name must be unique among clusters. The secret is used by all Core instances in the cluster, so ensure that you remember it. The Geocortex CoreSetup Wizard closes. If you do not want to install the viewer template now, you can install it later and proceed to the next step. For instructions on installing the viewer later, see Manage Viewer Templates. If you have not yet downloaded the viewer's installation package, download it from the Geocortex Support Center. For instructions, see Download Geocortex Essentials. In the Post Installer's side panel, click Configure Viewer Templates. Browse to the folder where you extracted the files from the installation package. Select the template file (.vte file), and then click Open. You are prompted to deploy the template to an IIS virtual directory. The Deploy Template to IIS dialog box opens. If the virtual directory listed in the Select Virtual Directory box already exists, type a name for a new virtual directory. Each viewer template must be deployed to a virtual directory that does not yet exist in the selected website. Click Deploy, and then close the success message that displays. The template is listed in the Installed Templates area. You must configure the host names that browsers and other web applications will use to reach the Essentials web applications. For information, see Hosts. If you do not configure the sign-in method, the default sign-in method will be used. Windows Authentication is the default sign-in method. You can change the sign-in method later. For instructions, see Choose a Method to Sign In to Manager. Continue the post-installation configuration at Step 6: Complete the Post-Installation Configuration. Portal for ArcGIS: See Option 1: Configure Sign-In Using Portal for ArcGIS. ArcGIS Online: See Option 2: Configure Sign-In Using ArcGIS Online. Windows: See Option 3: Configure Sign-In Using Windows. In the Post Installer, click Configure Sign-In Options in the side panel. Beside Sign in using, select ArcGIS. In the URL box, type or paste the URL for your portal. If you deployed Portal for ArcGIS to the default location, the URL will be similar to https://server.domain.com/arcgis/. Replace server.domain.com with the fully qualified host name of the server that hosts Portal for ArcGIS. The Post Installer connects to the URL. When the connection succeeds, the Post Installer displays a hyperlink to your portal. Click the hyperlink to open your portal in a browser. Sign in to your portal. 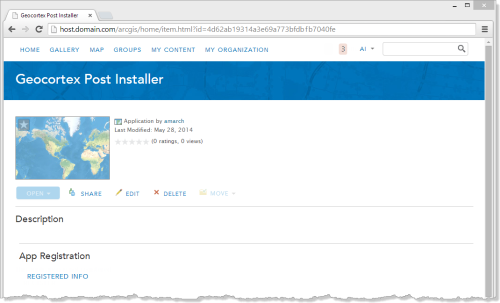 In your portal, create a Portal for ArcGIS application for the Post Installer to use. The Post Installer will use this application to add two web mapping applications to your portal. Essentials and Essentials Manager use the web mapping applications to access your private portal content. If you have already created an application for the Post Installer to use, you can skip this step and use the existing application. Select An application from the The item is drop-down list. 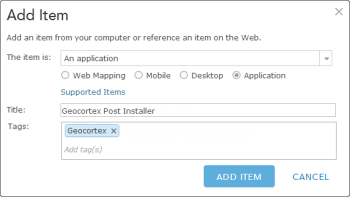 In the Title box, enter a title for the application, for example, Geocortex Post Installer. In the Tags box, add a search tag to help locate this application, for example, Geocortex. The application's details page opens. In the screen capture above, the App Registration area has a Registered Info hyperlink. This indicates that the application was registered automatically when you added it. In the App Registration area, click Register. In the App Type drop-down list, select Multiple. The dialog box closes and the application is registered. Registration creates the application's ID and secret, which are used like a user name and password. In the App Registration area, click Registered Info. You will need the App Registration information when you finish the post-installation configuration. Continue the post-installation configuration at Step 6: Complete the Post-Installation Configuration. In the URL box, type or paste the URL for your organization's ArcGIS Online portal. For example, https://organization.maps.arcgis.com/. Replace organization with the name of your organization's ArcGIS Online subdomain. In the URL box, type or paste the URL for ArcGIS Online's home page. Alternatively, you can click the https://www.argis.com/ hyperlink to enter the URL. The Post Installer connects to the URL. When the connection succeeds, the Post Installer displays a hyperlink for the URL. You will be prompted to sign in to ArcGIS Online when you finish the post-installation configuration. This allows the Post Installer to set up access to ArcGIS Online for Essentials. Beside Sign in using, select Windows. In the Group box, type the name of the Windows group that users must belong to in order to sign in to Manager. The default value is the built-in administrators group. This step is required, even if you have not performed any configuration in the Post Installer. In this step, the Post Installer deploys the Essentials web applications to IIS. In the App Registration dialog box, copy and paste the App ID and App Secret from Portal for ArcGIS to the Post Installer, and then click OK.
You are prompted to sign in to Portal for ArcGIS. The application's secret is encrypted in Essentials. Essentials does not share this information with any other application. Sign in to Portal for ArcGIS using the same account that you signed in with when you created the application. The Post Installer sets up access to your private Portal for ArcGIS content for Essentials, and then signs you out of Portal for ArcGIS. If you clear the Remember Me checkbox when you sign in, you will have to enter the App ID and App Secret each time you launch the Post Installer. In the App Registration dialog box, sign in to ArcGIS Online. The Post Installer sets up access to your private ArcGIS Online content for Essentials, and then signs you out of ArcGIS Online. The information gathered from ArcGIS Online is encrypted in Essentials. Essentials does not share this information with any other application. You have now completed the installation. To learn about Essentials and begin creating sites, refer to the Geocortex Essentials administrator help. The Administrator Help has a Quick Start section that steps you through creating a simple site, adding a viewer, and launching the viewer in a browser to view the site you created. The Quick Start also has a section on exploring the sample site that ships with Essentials. If you are new to Essentials, the Quick Start section is a good place to start.